With 43 days left until Christmas (how can this be, it seems like it was only yesterday Emma was splashing in the sea in Halkidiki?? ), all retailers, small businesses and private sellers have gone into a tizzy. And so have all the caring family members, especially the ones who have a lot of people and tastes to please and a budget to stick to. I must confess, with a baby on the way, I started extra early this year as I know that come December I will be too heavy and tired to go shopping or spend hours online trying to find bargains. Santa has already bought Emma (and even wrapped it all up) a lovely Barbie with complimentary car and a Tiana doll. She He has also thought of suggesting to daddy his helper to add to the stash a couple of girlie outfits from Vertbaudet, since they have an online Christmas pre-sale on already and voila, little girl sorted for this Christmas! I have also decided to put together a list of ideas for Christmas presents for your loved ones, since I know how limited our time is and how helpful lists can be. I will be adding up to the list hopefully every week, depending on energy levels and finds worth writing about! This week I proudly present you with three products we have tried as a family and approved of unanimously. The first, coming from the an appropriately-named company, Sent With a Loving Kiss, would make a lovely Christmas present for any chocolate lover. The tins would impress even hard to please mothers-in-laws as it gives the buyer the unique opportunity to personalise the chocolate box with a heartfelt message. I loved ours and I will keep it as a biscuit tin because of the personal message imprinted on it. 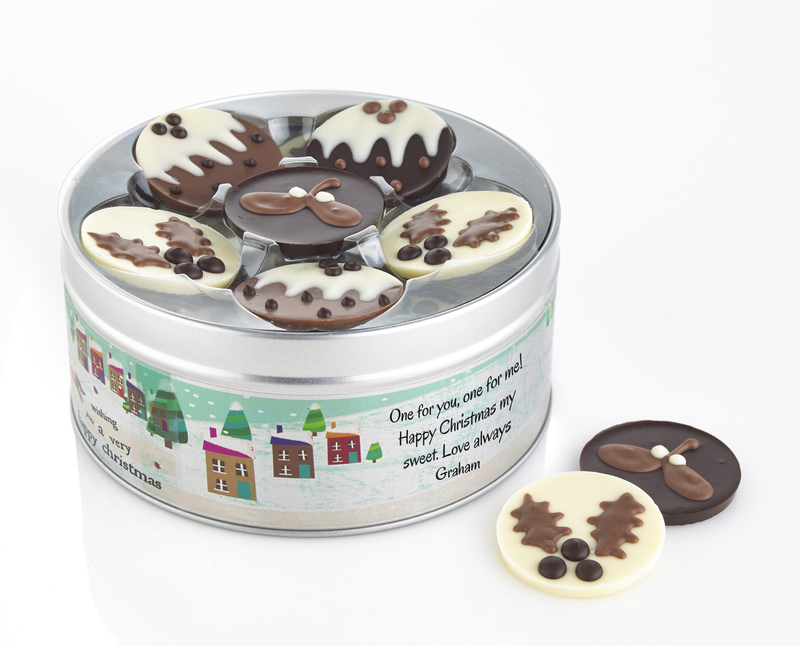 The chocolates were yummy and came in a variety of black, white and milk, with lovely Christmassy designs on them. The boxes sell with a slight discount at the moment, starting at £18.99. As a satisfied customer, I would assure you, they would make a very impressive and highly palatable Christmas gift! 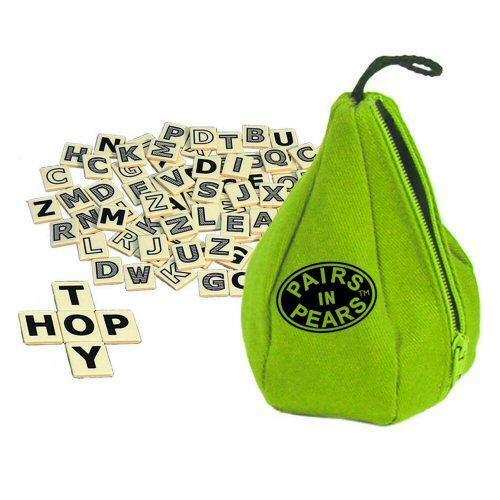 The second gift idea I chose for this week is the newly improved PAIRSinPEARS letter game. Why did we like it as a family? – We found it easily transportable: the game comes in a very cute, pear-shaped zip bag that can easily fit even in hand luggage (if you plan to travel this Christmas or if your family prefers camping trips in the summer) and can be carried around even by very small hands. – It is a game that grows with your family: you can use it with children as young as 4, for pattern grouping and learn your ABC games but it makes a fun game even for grown-ups who can use it to play competitive word grids. Who says Christmas is for slouching on the sofa, stuffed as a turkey?!? – Mummy was pleased as, unlike other family games, this one is easy to store away as it doesn’t take a lot of room. 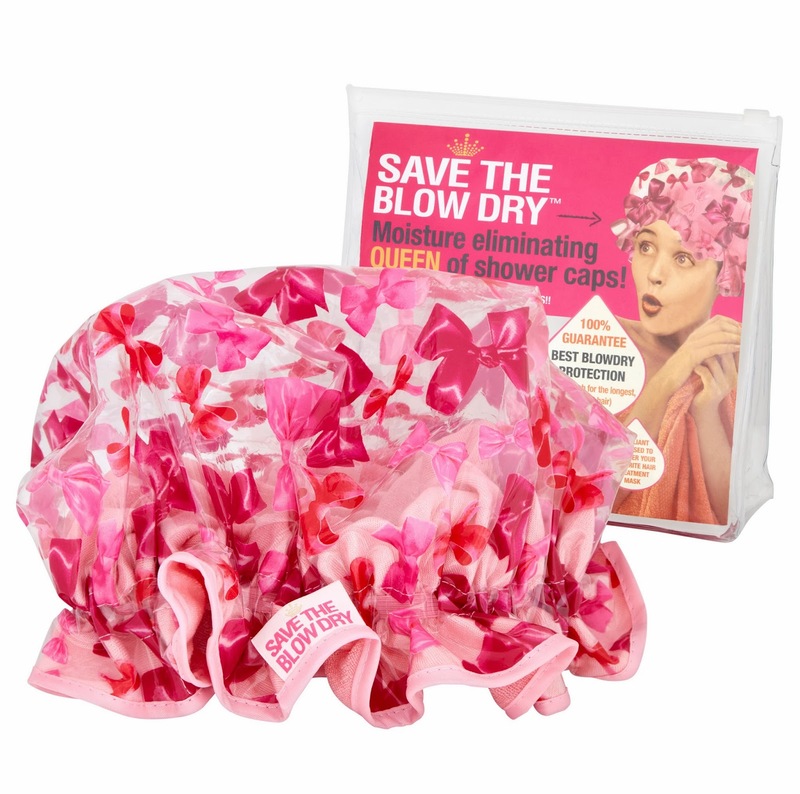 The last product I decided to include in this post is the funky looking and gorgeously girlie shower cap from Save The Blow. I am one of those girls who loves styling her hair and having it just right as I associate clean, styled hair with self-confidence and self-respect. BUT as a busy mum I am also always looking for ways to save time and energy bills so when I saw this particular shower cap, I knew I wanted it as an ally and asset :-). The fact that it comes in lovely, girlie, soft fabric pink and that it guarantees no frizzy, wet hair was a definite bonus! But the selling element for me would always be the fact that the company works in association with Khandel Light and that the sales finance a very noble campaign of improving living conditions in Khandel, one of the most impoverished regions in the world and support a cause I hold very dear, access to education for girls! So girls, saving your blow dryers while helping girls in India get an education, what could be more fitting and uplifting than that for a Christmas present? Hope you found this post inspiring. I was given the products above for reviewing purposes but all opinions expressed are entirely mine. Sometimes the best presents are the ones that you can eat! If you don’t have time to bake, send Christmas gourmet gift baskets. I send them every year to my family and friends. Very inspiring gift idea. I love Christmas very much. Thank you. Checked your Christmas lists as well, they don’t look too bad either!